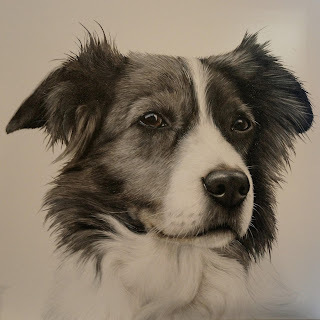 I was asked to do a portrait of Narla the Collie as a memory of a much loved family pet. Sadly Narla passed away last year and I believe it's safe to say she's left quite a gap. Narla was a 'Quirky, Old thing, full of character' but I think she looks pretty wise too! Collies are renowned for being intelligent dogs and I really wanted to capture that in her eyes, as well as her quirky personality. Debbie, Narlas owner was thrilled with the painting when I sent over a photo of the finished piece and now looking forward to hanging it in her home as a loving memory. It's always difficult for me to do a painting of a pet that's passed away but it's always made that bit easier to know the portrait will be a lasting memory and a way to capture their quirks and character. This is blog's first post. Go to main page.